1. In a non-stick skillet on medium heat cook ½ cup sliced almonds and 3 Tbs. Sugar Stirring constantly until almonds are coated with candied glaze. Quickly pour onto waxed or parchment paper to cool. Store in airtight container when cool. Set aside. 2. Prepare 1/2 head lettuce, 1/2 head romain lettuce, 1 cup chopped celery, 2 whole green onion, and 1 11oz. Can mandarin oranges drained. 3. Mix dressing ingredients until sugar is dissolved. 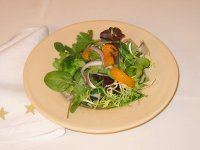 Refrigerate salad and dressing ingredients until ready to serve. Mix cranberries and sugar until sugar is dissolved. In another bowl mix jello with boiling water until jello is dissolved. Then add the cold water, place in refrigerator till jello begins to congeal. Fold in cranberries, grapes, celery and pecans. 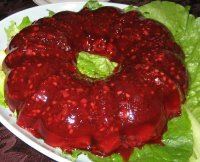 Pour into a jello mold or severing bowl and place in refrigerator until firm.